Our family has a hard time fitting all of our servings of fruit and vegetables in a day. We just discovered the new FaVe Juice Company. The USDA suggests 9.5 servings daily but on average many of us only integrate 4.5 servings into our daily diet. FaVe is a break through in 100% juice. Each serving gives you 3 full servings of vegetables at only 60 calories. 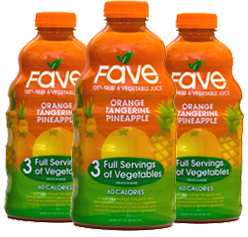 FaVe is 100% fruit and vegetable juice, all natural with no artificial ingredients and no added sweeteners, and lightly sweet. We found it to be on the tart side but we got used to it quickly. 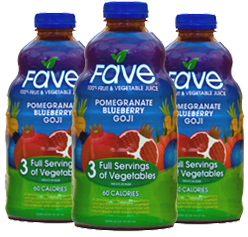 My kids favored the Pomegranate-Blueberry-Goji but like all three. What a great way to get your daily nutrition and with low calories. 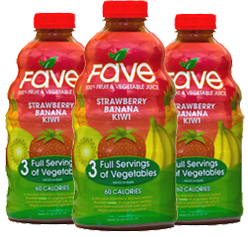 FaVe is perfect for the active family retails at an affordable $3.99 for a 46 oz recyclable PET bottle. I like this a lot. My husband and daughter put them in the freezer for a bit and took them to work. 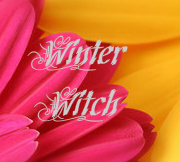 My husband liked that he was able to drink it and it enabled him to use his time more efficiently. I received product for the purpose of this review. It did not effect my opinion. ← Have You Heard The News About Brave?